This is a quick overview to the latest Inkscape 0.92.4 released at 16 January 2019. This release is an update of stability and bugfix. However, apparently it brings many new features which are very interesting for us designers. It has pipelining in/out feature now, so you can combine and iterate it with other tools like GMIC or ImageMagick as much as you want. I give you examples below including how to do bulk converting. This new release also includes speed and stability improvements as you can look at my gifs below. As you may know I edited a lot of screenshots on this UbuntuBuzz with Inkscape, I'm glad to review my own tool I love the most. Enjoy! I am using 0.92.4 as Snap package and not Flatpak nor DEB package. 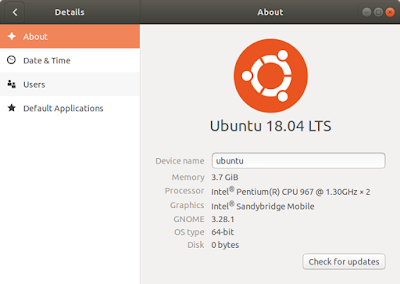 I install it on Ubuntu 18.04 LTS. 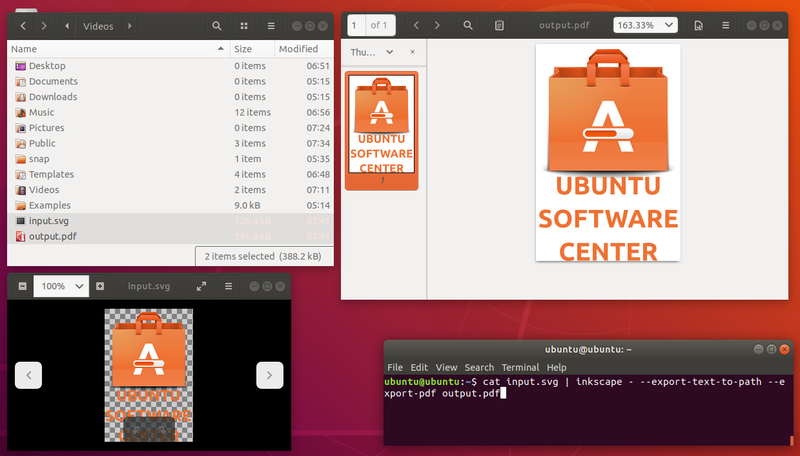 So you may see a little theme mismatch between original Ubuntu look-and-feel and the Inkscape running as Snap package. More information about Snap you can read on official website. 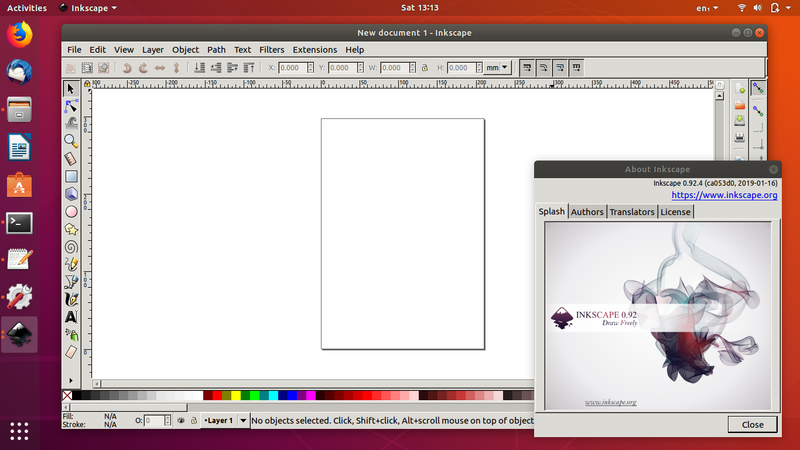 Fortunately, for all GNU/Linux distros, now Inkscape is available both in Snap and Flatpak formats. 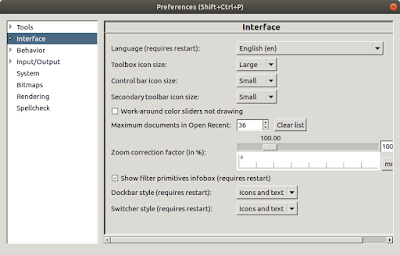 If you are using Ubuntu 16.04 or later, or if you are using Fedora 24 or later, you are already powered with Snap or Flatpak respectively. 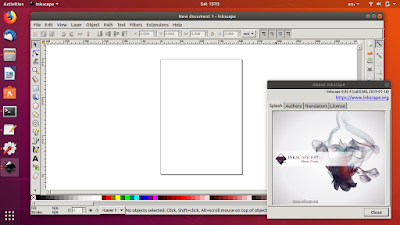 What you need to do is to install latest Inkscape 0.92.4 using respective tool you have. Yes, you do not need sudo. Personally, I myself like Snap more than Flatpak as I am a heavy LiveCD user which is limited by RAM space. On 18.04, Inkscape snap size is only 180MB, while Inkscape flatpak size is more than 350MB. The official release notes said there is a new things on Objects Alignment (Ctrl+Shift+A) feature. You know, it is the pair of Align Relative To and Treat selection as group options. Precisely, it is a fix to make it better (more straightforward). Actually, this feature is available on 0.92.3 too. I cannot find any difference between 0.92.4 and 0.92.3 except for Align ... Anchor buttons where 0.92.4 makes it fixed once, and 0.92.3 adds it every time I click the button. I use Relative to: Smallest Object here as example. Pay attention to the guide lines I set there. In case you wonder the difference to the version 0.92.3 one, pay attention to (1) the two Center on ... axis buttons and (2) the four Align ... Anchor buttons I pressed multiple times. In short, 0.92.4 is better now as it is more straightforward in the alignment against axis and edges. Sliding it by holding Ctrl is now skipping. If max value is 255, then it is per 16 points. If max value is 100, then it is per 10 points. Now, Inkscape will not lost object selection after running an extension. I believe many of you longing for this. Let us try SVG file example (1MB) from Marcel Partap, who reported the issue from 0.92.3, in which the file was created by Adobe Illustrator 16. In 0.92.3, saving the file is very slow. Even causing crash. Now in 0.92.4, it is fast. Without crashing. 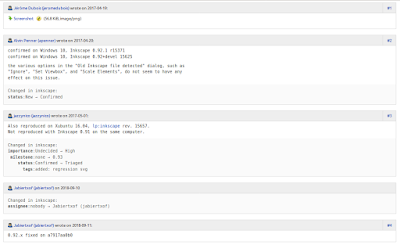 Pipelining (combining multiple command) is now available in Inkcape 0.92.4. You can pipe in, you can pipe out, you can also combine pipe in and out with any other graphic processing programs in command line. 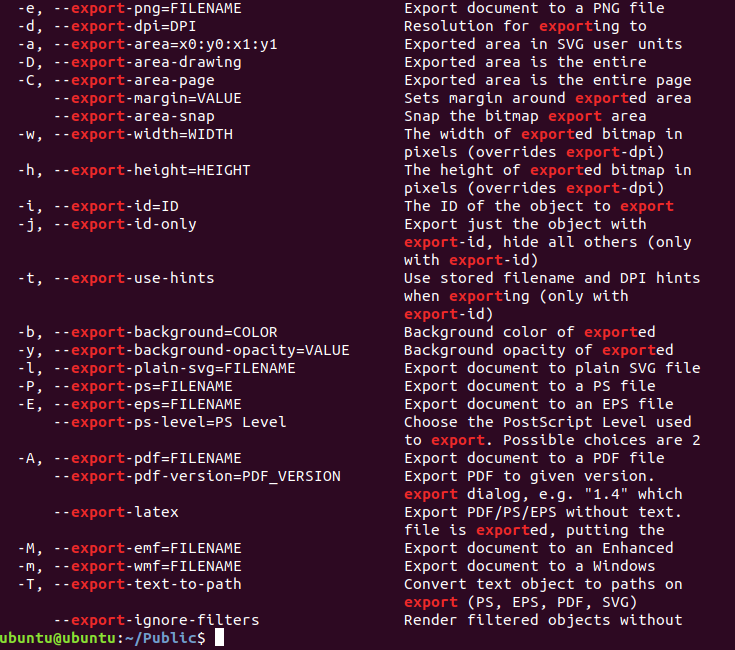 For example, you can now convert 1000 files from SVG to EPS by 1 command only. 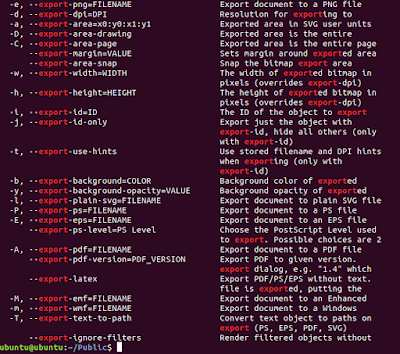 More example, you can now bulk export text to path ("outline") from SVG to PDF thanks to command line. You can combine inkscape command line with cat, convert (ImageMagick), gmic and any other tools you can think or imagine. See my gif animations below for more. You can compare both before and after by finding on the page "standard input" and "standard output". Prior to 0.92.4, Inkscape did not have such features. Now let us try the real command lines. Let's assume the input file name is input.svg and the output file name is output.[extension]. Bug 1772883 says that a certain problem with latest Poppler library prevented Inkscape to be built on macOS. Now it is fixed and macOS users can build Inkscape 0.92.4. 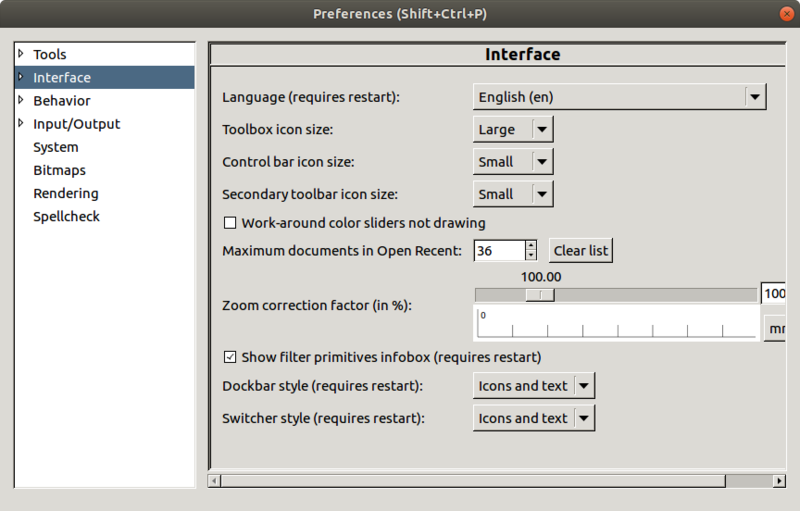 To change Inkscape user interface language, go to menu bar Edit > Preferences > Interface > Language. According to Release Notes, Inkscape got improvements in Brazilian Portuguese, Hungarian, Icelandic, Romanian, and Spanish. 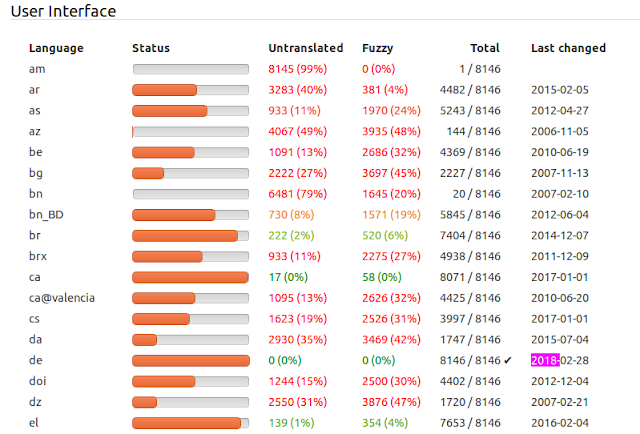 You can see the statistics of translated languages of 0.92.x here. You see, there are so many languages being translated and some of them are completed (100%, each marked with a check mark). Among those completed are German (de), France (fr), Hungarian (hu), and Ukrainian (uk) which are all finished in 2018. 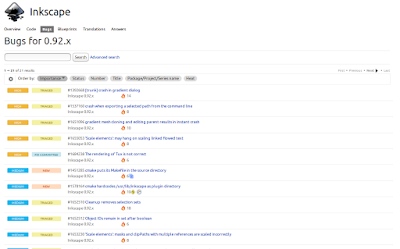 You can help translate user interface into your mother language by following official guide. 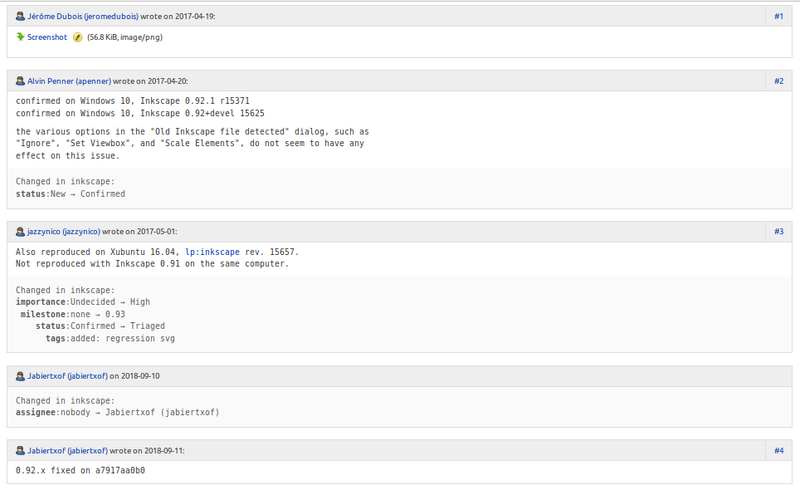 As mentioned above, the manpage and help are freshly updated. 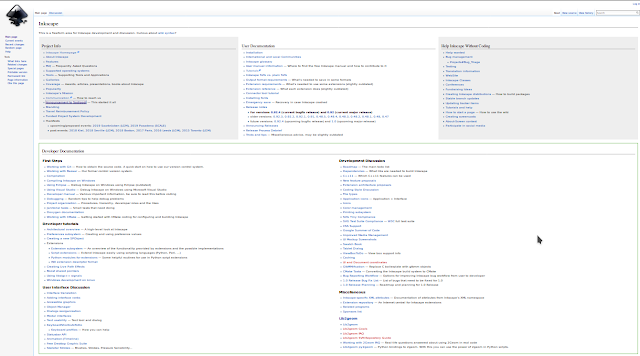 The wiki also receives some changes not in user manual, but in news for the next international events (SCALE). 8. Wanna see developers discussing? I believe many of us are curious how Inkscape being developed by developers. They write code, test it again and again, find some bugs, report it, discuss it, and repeat the whole process. Do you want to see that? So let us see the examples right now. 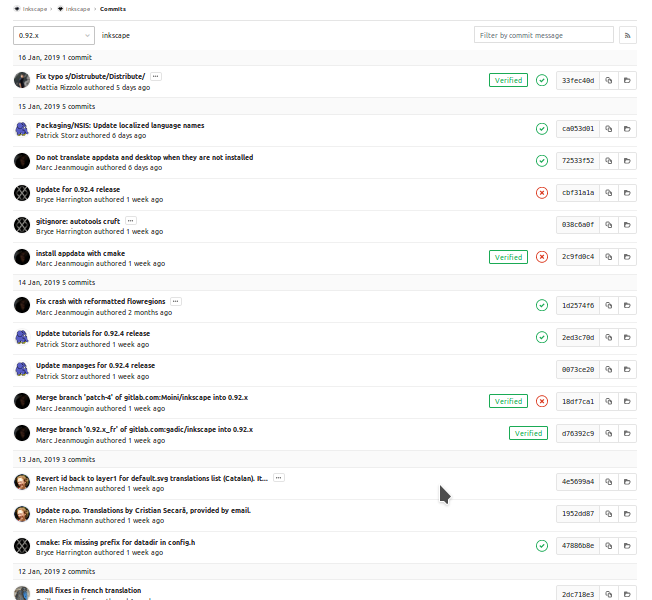 Note: if you wonder why Inkscape has two bug report places, it's because originally Inkscape was developed on Launchpad, but since 2017 the project announced it's migrating to GitLab.com. The migrations is in progress up to today. There is a new video guiding new users to report issues to Inkscape Developers. The video animation is clear and very easy to follow. If you find error and you inform the developers, you help the whole community since the error might be fixed faster. 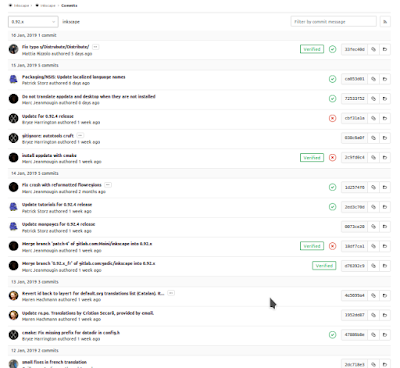 You should have a GitLab.com account (registration is gratis) to do it. 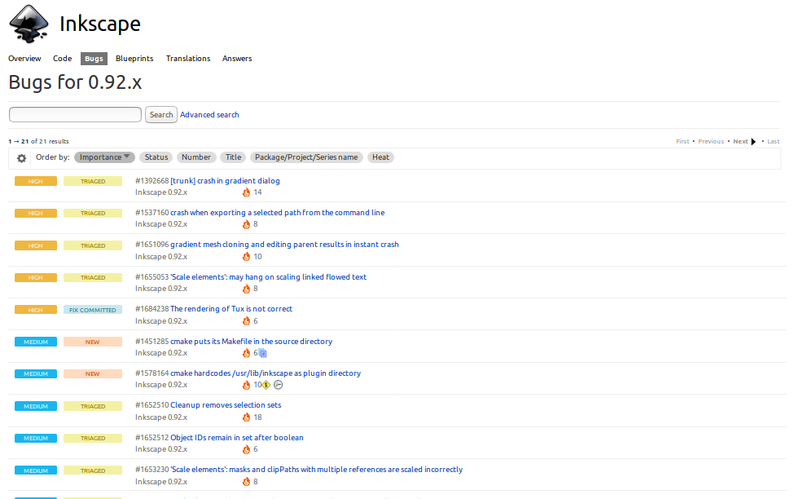 For more information in bug reporting, see contribute page. Do you know Inkscape project first announcement? It was a "from Sodipodi to Inkscape" announcement dated back to Wednesday, 5 November 2003 (16 years ago). Read it here http://wiki.inkscape.org/wiki/index.php/Announcement_to_Sodipodi. You see, since the very beginning Inkscape was indeed aimed to be fully SVG image editor, with C++ as the language, and modular by extension. I hope this motivates everybody to work with and contribute to Inkscape. Enjoy! That's all. My biggest impression so far is the command line feature. This paves us the way to join between both vector and bitmap tools even with loopings. If you do not have idea about how command line works, I strongly suggest you to learn it, as now Inkscape gives you greater, unlimited possibility with this. I really really like how I could learn more about Inkscape by the time I write this article especially the way developers discussing a lot about Inkscape. I also celebrate the AppImage version of 1.0alpha. Finally, I like this release. And now, I am looking forward for 1.0 final. Happy working!